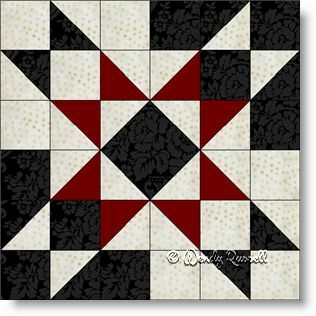 A quilter's favourite - the twelve inch quilt block. These are probably the most commonly used. The measurements divide easily and evenly for quick calculations. Whether the goal is a bed-sized quilt or a cuddle quilt in an afghan size, a 12" quilt block is your go-to choice. I took liberties with this Casino Royale quilt block by adding in a third colour. I think it has far more possibilities when you start to lay out the nine patch blocks in your quilt. I thought it needed both red and black to go along with the "casino" colour scheme of a roulette table. Another change is subtle -- I made the centre patch as a square in a square, rather than the original group of four separate half square triangle units. I always think less seams equates to a more precise block and of course, less bulk. The sample quilts illustrated use 90 degree rotations of some of the blocks to produce a secondary pattern, which is always a nice surprise.